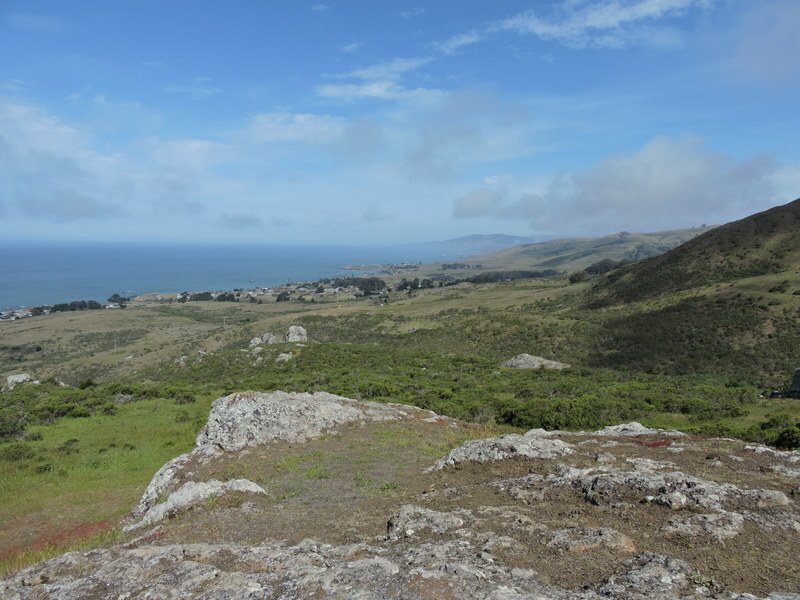 Just a mile or two north of Bodega Dunes Campground along Highway 1, there’s a turn-off for Coleman Valley Road. Most drivers, mesmerized by the beauty of the Pacific coastline, drive right by. But signs that read “Winding One Lane Road” are like catnip to us. It takes longer than half an hour to drive the ten miles between Highway 1 and the tiny town of Occidental (not counting all the times we stop to take yet another photo) but it’s our favorite drive in Sonoma County. On one of those rare days when the weather is clear, the views of the Pacific coastline are spectacular. However, this is what it looks like today. We start out a little disappointed that we can’t see the gorgeous view, but as we drive through the coastal range, we begin to appreciate this gentler, more elusive beauty. 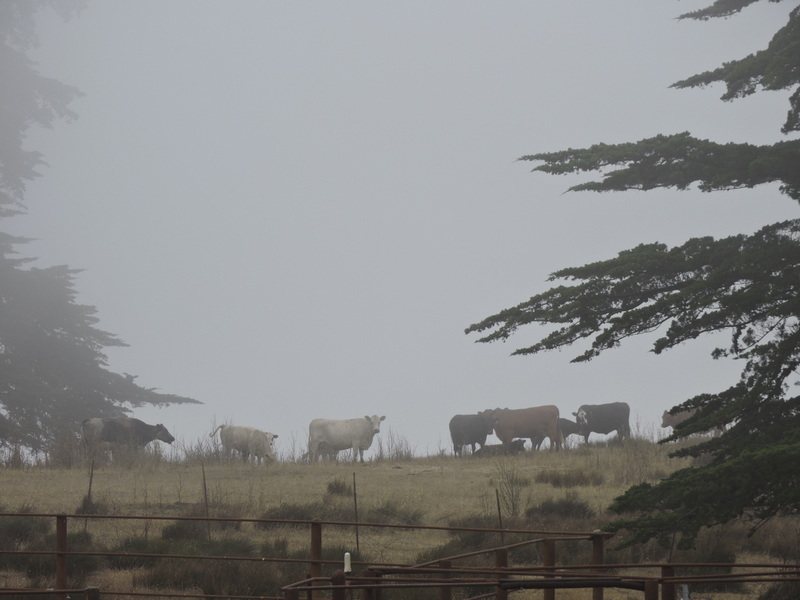 Cattle appear like apparitions in foggy pastures. 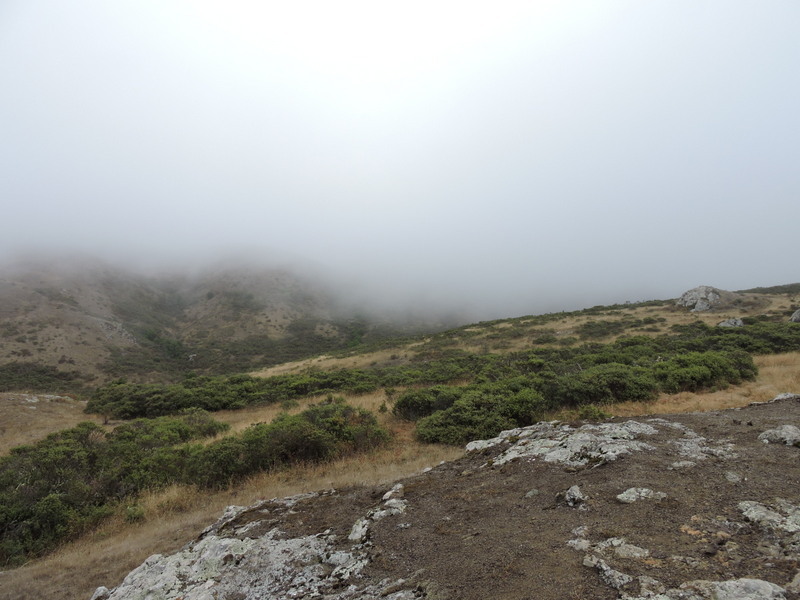 When we crest the coastal range, the fog begins to clear. The landscape changes from pasture to forest. 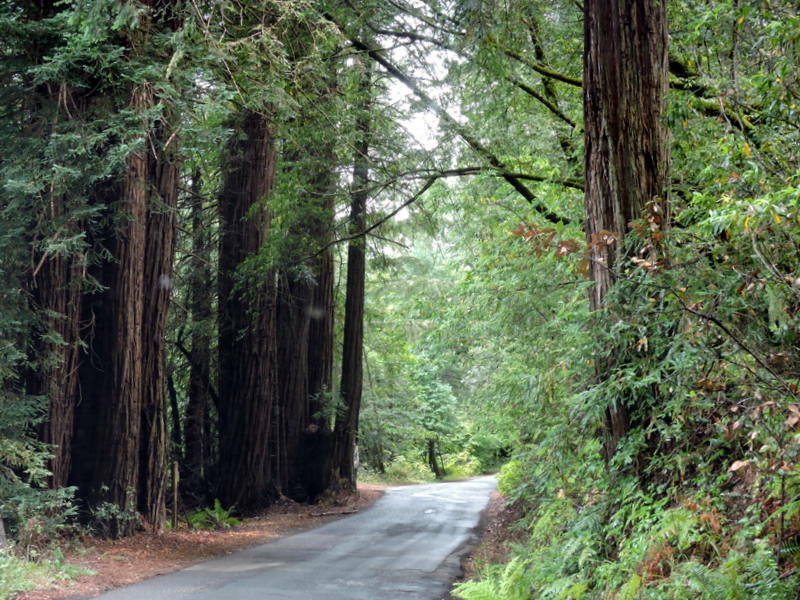 Redwoods line the road and form a living canopy over us. Finally we reach our destination: the tiny town of Occidental. 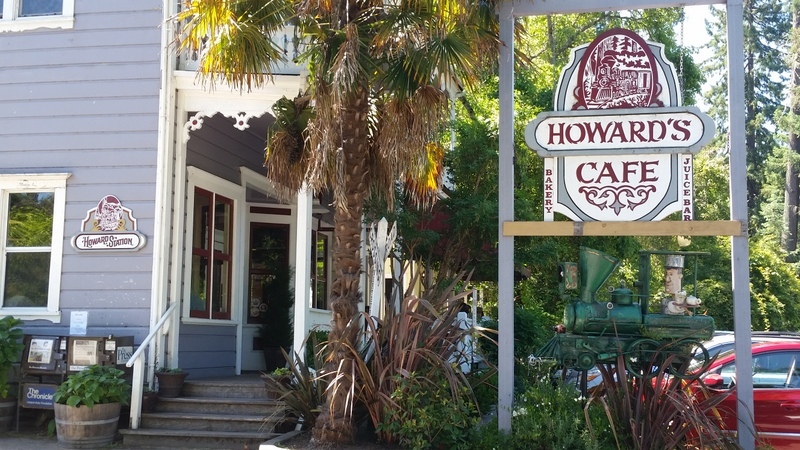 Howard’s Station Cafe in Occidental is hands-down our favorite restaurant for breakfast. We love to sit at one of the tables on their front porch, chat while we sip our Taylor Maid coffee, and linger over a hearty breakfast. Besides omelettes like my favorite Smoked Salmon Omelette Florentine, Howard’s has the best Eggs Benedict, banana-walnut or blueberry pancakes, and an excellent breakfast burrito. If your tastes run more to “healthy alternatives”, you can order dishes like Tofu Rancheros or Organic Brown Rice Scramble. And I haven’t even started on their extensive espresso and juice/smoothie bar! And did you notice? 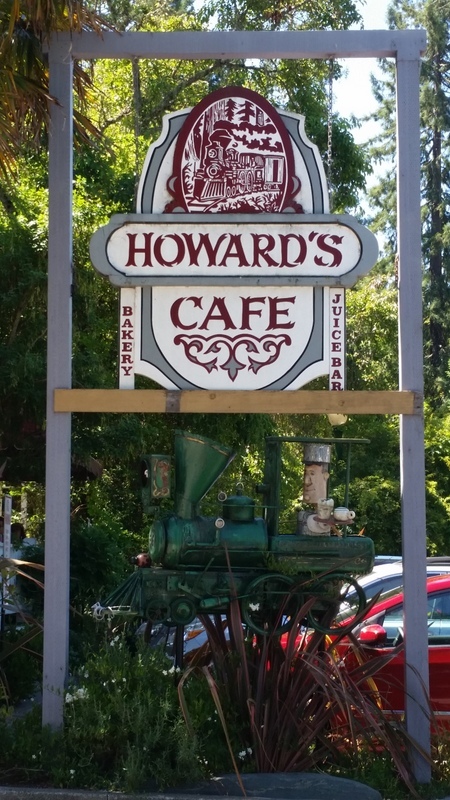 There’s an excellent Patrick Amiot “junk art” sculpture of a train and its engineer right below the Howard’s Cafe sign. 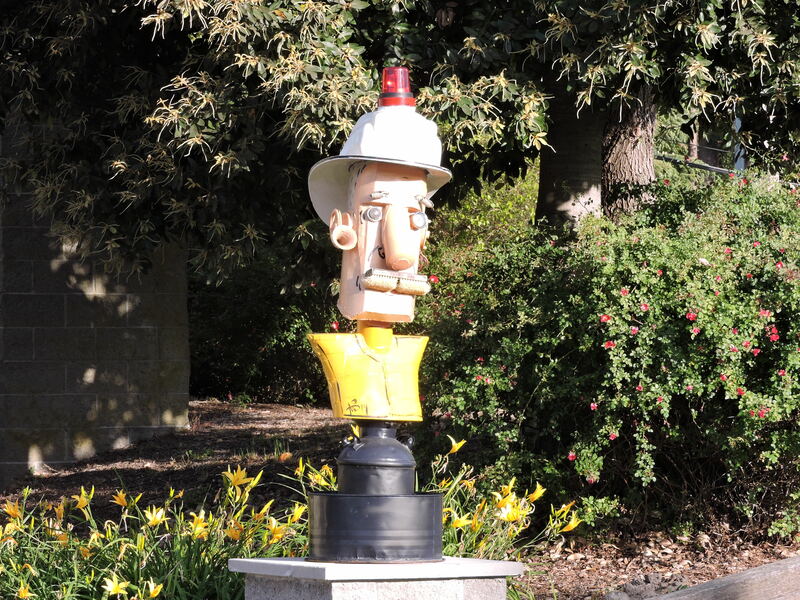 This entry was posted in Junk Art, Sonoma County CA on August 2, 2015 by admin.